July was partially consumed with the first stage of a very large project. There were a lot of inspections in this stage and even more will be scheduled for October. One of the inspections was of this building. This is the back side of the Columbarium at Bohemian National Cemetery in Chicago. For those who don't know what a columbarium is, this is the dictionary definition: "a sepulchral vault or other structure with recesses in the walls to receive the ashes of the dead." 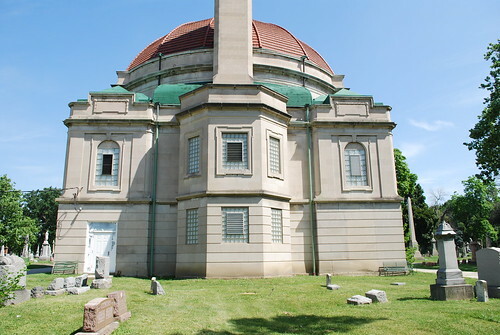 The building was built in 1915 and it, as well as the entire cemetery, are on the National Register of Historic Places. I went here last year to research how much we'd have to inspect of this place. It's exceedingly peaceful, although it's bounded by two heavily traveled roads. While driving around the cemetery, I discovered this was the burial area for most of the Eastland disaster victims. I talked about that in post from a year ago. 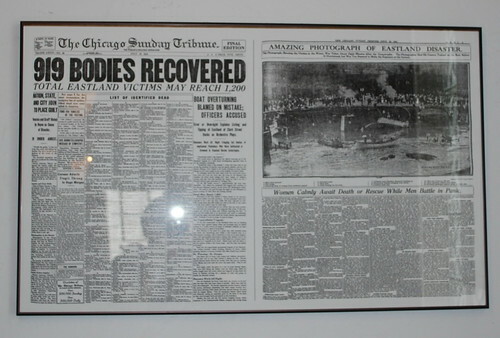 In the west hallway of the main floor, there is a framed replica of the newspaper. 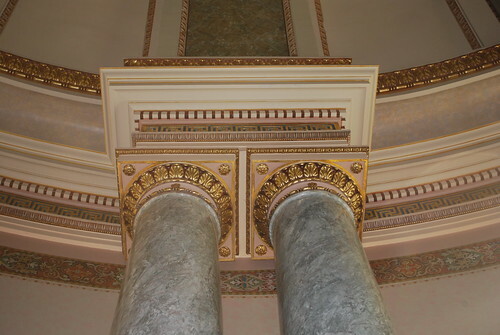 is adorned on the inside with painted plaster and gold leaf. There are 8 marble columns, two in each cardinal direction "corner". 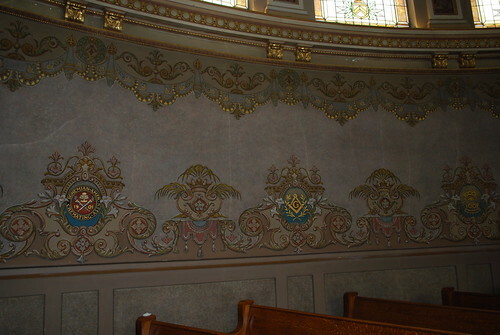 While the plaster is cracked, the painted decorations around the dome area are still in excellent shape. The building is not air conditioned and has suffered water damage from leaks. 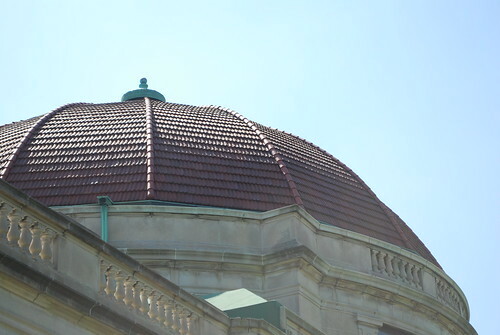 The dome shows signs of wear, but the original builders were very astute in designing and building a structure which has held up exceptionally well for over 100 years. 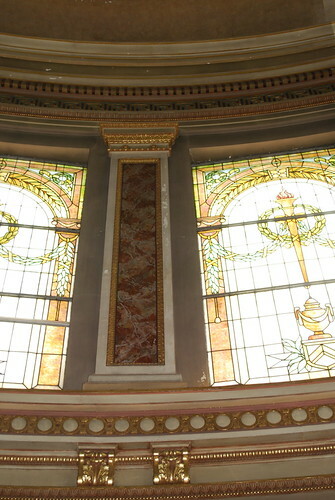 There are 8 stained glass windows around the dome. They are all the same. I couldn't see anything wrong with the windows, although, admittedly, they were at the equivalent of the third floor from where I stood. I've never been in a place like this so it was an honor to do the inspection. 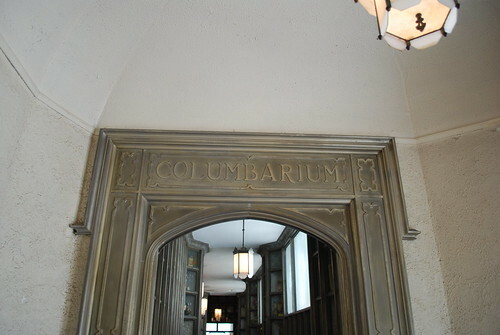 This is the entry to the east columbarium. There were 4 areas inside the building where ashes could be stored. This is the oldest of the 4 locations. Left side of the arch. Right side of the arch. I had to inspect this hallway. The west side is just like this but it doesn't have the ornate arch. 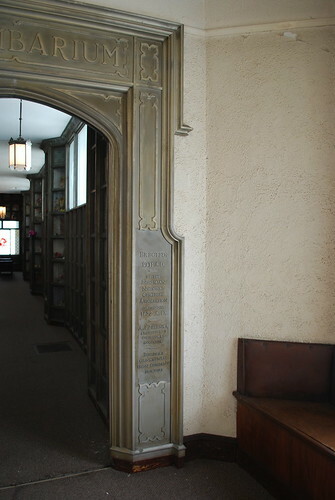 The hallway is lined with carved wood "shelves", for lack of a better word. There are rows and rows of niches in which urns containing ashes are placed. Most had some other things in the niche with the urn; dried flowers, photos, death notice. There was a plaque inside the niche giving name, birth and death dates. The oldest urn was dated 1916, but I admit I felt it disrespectful to look at all the urns. A few were empty, leading me to wonder if there is a storage fee one has to pay, even on those long buried. What if you're the last of your family? Or were the urns removed because family no longer wanted them here or were moving and wanted to take great-aunt Bernice with them? Would those niches ever be used for more recent burials? This particular hallway had etched glass windows. 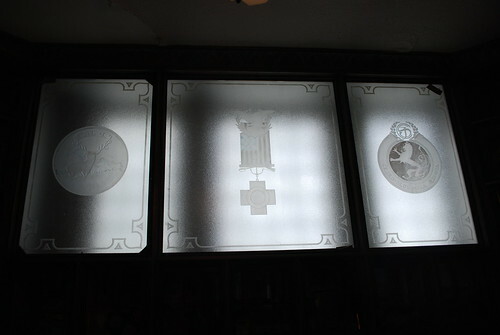 As befitting the name "Bohemian", these panes represent eastern European fraternal societies. They were instrumental in getting the cemetery plotted and getting the columbarium built. As my mother and her mother's family are from the Czech Republic, I felt a particular kinship with this place. Many of those buried here were Jewish. It's one of those places where, if I could just win a very large sum of money in the lottery, I would approach them about an endowment to rehabilitate the building, add air conditioning, fix the leaks and the broken plaster that came with them, renovate the bathrooms and leave a legacy to keep this place functioning. It wasn't creepy at all to be in the place, even after I processed what happened as I was finishing the interior inspection. through those doors visible at the top of the stairs, into an alcove and then into the main hallway lined with niches. This hallway is two stories tall with recessed and ambient lighting. I've set the stage here for what comes next. I'm looking south, not that the direction matters. To my right is the entrance into this room. 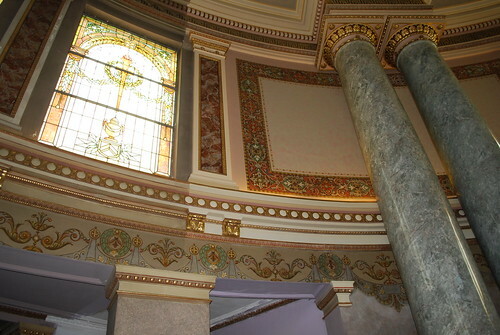 Next to this room is a wide stairway heading down and the ceiling between the entry and the dome area. There are columns at the east and west side of this area. This is the column near the room where I was. The name of the donor of the column is on this face. 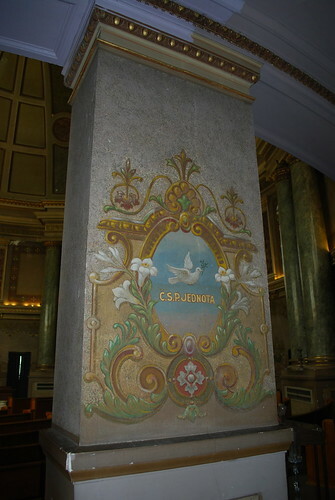 You can see the intricate and beautiful painting on the column. 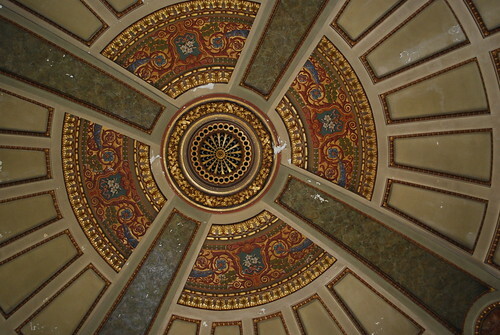 The direction of this photo would have you looking into the dome area. You can barely make out some of the marble columns in that area. To the right, out of sight, is the entry hallway and the west hallway. I was completely alone on this level. The head of maintenance had turned on all the lights and left. In fact, at the time I was doing this inspection, he said he had things to do in the cemetery and was I okay to be left alone. I rather prefer doing inspections without company. Sometimes people are not real happy when I point out things which are defects and which I need to document. He also would have been bored as ladders and other repair equipment told me they know what needs to be repaired. We talk into a small tape recorder and describe what we see. I was was talking about the water damage on the south wall and turned, slightly, to the corner of the south and west walls. Out of the corner of my eye, although not really straight corner, I saw a white-haired elderly gentleman in a black suit walk from the main entry hall, make a right and head into the west side hallway. I saw him clearly; white hair, black suit with a white shirt. As my voice sort of echoed in the space, I dropped the pitch so as not to disturb him, and continued with my inspection. When I finished the room, I walked down the east hallway. There wasn't much to see. 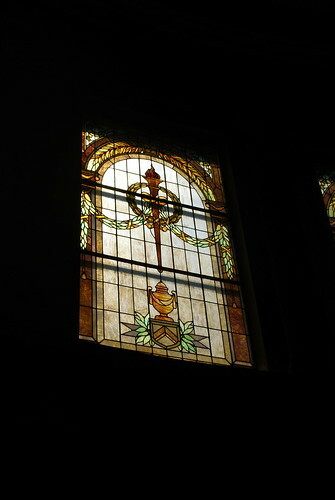 I documented the etched glass windows and the plaster damage to the ceiling. 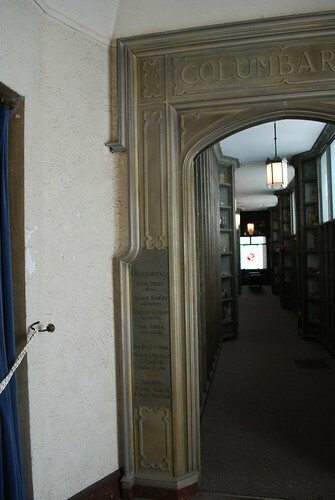 At the far north end, I realized there was a small alcove with doors leading to the entry alcove. I didn't remember seeing that in the west side. I probably missed it. I needed to make sure I checked it. The north room of the west side had extensive water damage to a corner and the ceiling. It wasn't exactly like the room on the east but there might have been an alcove and I skipped it. It had taken me 10 minutes to inspect this hallway. I walked out of the east hallway and cautiously approached the west hallway. The last thing I want to do is disturb someone who is paying respects. Of course you knew there was no one in that hallway. The little old man was not there. I walked all the way to the end and discovered there wasn't an alcove on the west side. That's why I didn't remember one. It seemed odd, though, that the man wasn't there. Perhaps, it didn't take him long to pray or whatever and he left via the front door or he could have gone down the west stairs. Ten minutes can be long enough for someone to pay respects and leave, particularly if he used the stairs. Whatever. I inspected the main hallway and then entered the entry alcove. The light wasn't on and the switch I found didn't turn the lights on. After inspecting the wall with the front doors, I figured I'd crack the door a bit so the bright sunshine would illuminate the room. The doors were locked. 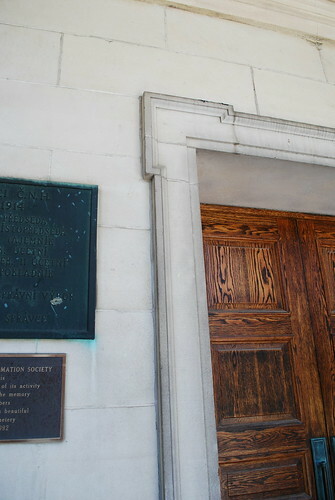 This is the inspection photo of the left side of the front door, but you can see the heavy wooden doors on the building. The other thing is, when I went from the west to the east hallway, there was no one in that middle area. I would have seen them because I debated doing the middle hallway before the east but opted to save that since it had the entry alcove with it. These doors were shut tight. I finished the inspection of the alcove and walked from the north end to even with the hallway. He had been walking not fast but at a good pace. It's possible that he could have gone down the stairs and I wouldn't have seen him leave. There was no sound because the floors in these hallways, are carpeted. I've heard that you can "feel" a ghostly presence because it manifests as a cold spot in an otherwise normal temperature room. It was hot the day of this inspection, so hot, that I'd had to wipe my face on my shirt several times while completing this. The place isn't air conditioned and the air inside was still, close even, you could say. There was no cold spot. There was nothing, other than the sighting of this little old man making a right turn into the west hallway. I was never scared. It seemed odd, but I finished the stairwells and then did the exterior inspection. It stayed in the back of my mind and I puzzled over how fast the man had to be to leave without my seeing him. It never occurred to me to ask the head of maintenance when I checked out, if there had been anyone in the columbarium. If he was on the other side of the cemetery, he wouldn't have known. In relating the story to others, I've had people tell me 10 minutes is enough time, even if he'd walked all the way down to the end in the west hallway, to pay a modicum of respect and leave the building via the stairs. It's possible I think it took 10 minutes, but it actually took longer so there would have been plenty of time for someone to leave. He could have been more agile than I think which would have allowed him to move faster. He would have known where I was since my voice, even dropped in pitch, echoed and I was embarrassed to disturb his contemplation. Another theory is one advanced by a number of science-fiction buffs and which was explored in Star Trek: The Next Generation. This theory says there are any number of realities, all co-existing on top of one another. A ghost is not a manifestation of someone passed, this theory says. It is that person's reality intruding upon someone else's reality. This means that in another reality, this man is alive and walking into the columbarium through open doors to pay his respects to someone in the west hallway or to arrange to have someone placed there or any number of reasons he was in that spot at that time. His reality, for the brief 10-15 seconds I saw him, intruded upon my reality. He never turned to look at me although I find it hard that if he were "real", he wouldn't have known I was there; that whole "echoing voice" thing. When I saw him, he was walking, determinedly, toward the west hallway. I'm down to Occam's Razor now. I've rather eliminated the idea that he went down the stairs, given that he came from the main entry. I also don't think he could have moved fast enough to get down the stairs without me seeing him. The only caveat would be if he visited someone in the very first room of the west hallway. Still, that seems an awfully short amount of time to say hello to grandma. 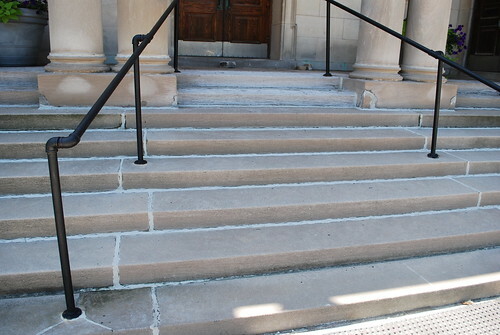 I also think I would have heard him or some noise as the stairs were worn marble and not carpeted. Could he have been in the front alcove, which was dark, and I missed seeing him because he was in a black suit? Possibly, but why be in an area where the doors were locked. There would be no purpose to standing in the alcove. And no, I didn't see anyone come up the stairs the entire time I was inspecting the dome. If my presence bothered him, he could have gone into the dome area and just sat or sat in the south or north rooms of the west hallway and waited for me to leave. He could have asked me to leave and come back at a later time. I would have said, "I've got stairs left and then I'll be heading outside. If you like, I'll wait on the west stairs until I've finished the exterior." I never saw him in that hallway. So, [cue Twilight Zone music], ahead of Halloween, there is your ghost story for the month. I still ponder this even though I've decided I did see a ghost. 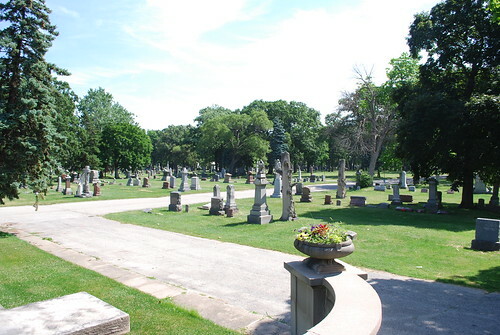 I've since discovered that Bohemian has a reputation for being the least haunted of all Chicago cemeteries, even given it's the final resting place for Eastland victims. As I said, I was never scared and am not scared at the memory. It's interesting, to me, to feel that a man loved someone so much, he comes back to visit them even after he's passed on.